In Balance Yoga Studio hosts their free annual Yoga Festival titled Kunga Fest, Volume 3 starting on Friday, November 9, 2018 through Sunday, November 13, 2018. 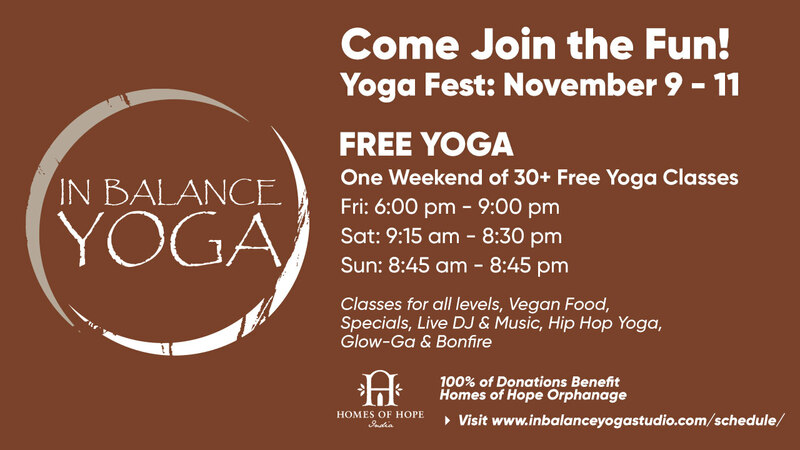 In Balance Yoga is excited to offer a weekend of more than 30 free yoga classes for the public and accessible for all levels! We call this event Kunga Fest inspired by our new partnership as an affiliate of the Kunga Yoga School. Kunga Fest offers a great introduction to the benefits of Yoga for Life while fundraising for a cause. Those who are new to yoga can try it commitment-free, and those who practice regularly can try a different style at no extra cost. The goal of Kunga Fest is to raise funds for Homes of Hope Orphanage in India, one of the non-profits we support annually. 100% of donations will help fund toilets at the orphanage. The capital project for the toilets is $8,000 and we hope to fundraise 50% through this community weekend. Participants can register online at: https://www.inbalanceyogastudio.com/schedule/. If you are a new student, you can save time before your first class and register on the New Student Page at: https://www.inbalanceyogastudio.com/new-students/. Donations will be accepted during Kunga Fest at the studio and by calling In Balance Yoga at 540-961-1030. To view the event flyer, visit: https://i.imgur.com/jm25dOz.jpg. For more information, visit: https://www.facebook.com/events/2317036158307841/ or http://www.inbalanceyogastudio.com or https://www.facebook.com/InBalanceYogaBlacksburg or call 540-961-1030.